Recycle bottle caps to make miniature Christmas photo ornaments for the Christmas tree. Do you need more ornaments for your tree? Get a large bottle cap and recycle it into an ornament. 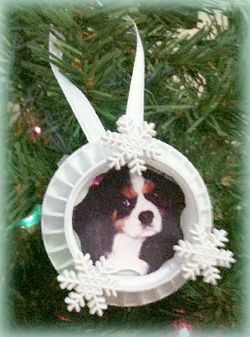 Display family, friends, or pet photos on your tree with this easy project. 1. Take large bottle cap and turn over and insert photo of family or pet. 2. Glue on buttons and trim. Designer Laura Koob is an original artist who has images of her work throughout the United States, Canada and Europe. She is a self-taught artist who works with painting, sewing and photography and has copyright images dating back to 1983.